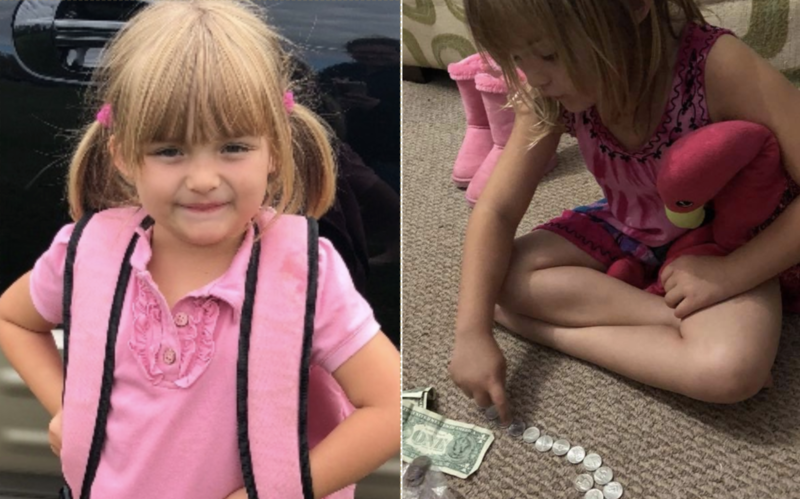 Two weeks ago, a 5-year-old girl named Sunshine Oelfke of Ishpeming, Michigan, emptied out her piggy bank onto the living room floor and immediately started "counting." Her grandmother, Jackie Oelfke, thought she was playing as she carefully lined up stacks of nickels, pennies and dimes — but then she saw the girl stuff the coins and crinkled bills into a plastic bag and place it in the front pouch of her backpack. "That piqued my curiosity," Oelfke told CBS News. "Nobody messes with the piggy bank." After observing Sunshine at work a few minutes longer, Oelfke decided she needed to find out why the little girl decided to break into her savings. "What are you doing with that money?" Oelfke asked her granddaughter. "I'm taking it to school," Sunshine replied. The little girl finally spilled the real reason why she needed the money. "I'm going to take it for milk money. I'm taking it for my friend Layla," she explained. "She doesn't get milk — her mom doesn't have milk money and I do." Oelfke's heart sank and melted at the same time. The 5-year-old was raised in a non-traditional household, Oelfke explained. Her mom is a drug addict and has been in and out of prison. "She's going to have enough issues growing up with this," Oelfke said. "I've never told her she can't do something, and I didn't want to start now." Last week, Oelfke and Sunshine met with her teacher, Rita Hausher, at Birchview Elementary School and handed her the $30 the kindergartner had saved. There are 20 kids in Sunshine's class and about half don't get milk. It costs $0.45 a carton. The total adds up to about $180 a month for every child in the class to have milk every day during snack time. "Milk is important in our family, so it's very important for Sunshine's friends to have milk with her," Oelfke said. After dropping Sunshine off at school, Oelfke posted a tearful video on Facebook to explain her granddaughter's mission. The video was viewed more than 1,500 times. To her surprise, dozens of people offered to donate toward the cause. Oelfke started a GoFundMe page, hoping to raise $700 to cover the cost of milk for the entire semester. Within a week, Oelfke raised more than $1,000. Now every student in Sunshine's class will have the option to get free milk for the rest of the year. "Guess what! My whole class got milk today," Sunshine proudly told her grandma on Thursday. "Layla now has milk money." Oelfke said Sunshine doesn't see her kind act as a big deal. She was just trying to look out for her friends. "She doesn't understand the impact she's made," Oelfke said. "But now she knows she can do whatever she puts her mind to."